If you haven’t set up iCloud and Find My iPhone yet, now is a good time to do so. Follow our guide below on how to get this configured on an iPad, iPhone, iPod, and a Mac, then read on for a story about how a police officer used the application to locate an iPhone thief and return the device to it’s rightful owner. This is easy to set up so don’t wait. You’ll need iOS 5 or later on the iPhone, iPad, or iPod touch, or OS X 10.7.2 or later on the Mac. You will need an Apple ID, iOS 5 or later on an iPad, iPhone, or iPod touch, and iCloud setup. It’s that easy to turn on, but you’re not quite finished yet because you will want to also install the Find My iPhone app for iOS. The Find My iPhone application is a free download on the iOS App Store, and lets you locate the iOS devices or Macs on a map, send messages and pings to the devices, and even remotely wipe them of their data. The Mac will now be accessible via the iOS Find My iPhone app in the device list, and can also be pinpointed on a map using the iCloud.com website. The ace up the sleeve of Officer Garland, an avid Apple consumer was something called “Find My iPhone,” a free 5.4-megabyte piece of software, or app, that he had on the iPhone in his pocket. Punching in the victim’s Apple ID … he quickly determined by the location of a small gray phone icon on a digital map that the robber was near Eighth Avenue and 51st Street. As Officer Garland and his partner drove there, the signal source shifted, closer to Eighth Avenue and 49th Street. There, a man later identified by the police as George Bradshaw, 40, of New Lots, Brooklyn, stepped outside a Food Emporium. Officer Garland pushed the “Play Sound” button on his phone. Instantly, a pinging beep — not unlike the sound of a submarine’s sonar — began emitting from Mr. Bradshaw, 20 feet away. The victim later identified the robber and got her iPhone back. This is arguably the best part of iCloud, for now at least. Matt, it’s funny but yes. Until maybe 5.1 is out. Cause even if you set up lock password for device, iOS still allow to shut down(and restart) device without password demanding. I’m still not understanding the benefits of find my iPhone – especially from a police/criminal perspective as this story was published. 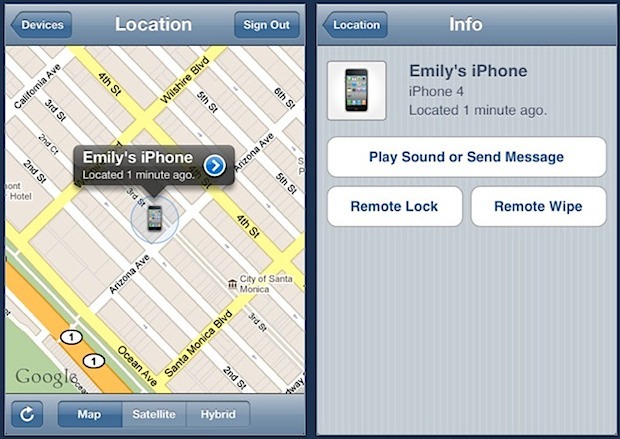 If you stole an iPhone, wouldn’t you: A)Wipe it B)Remove the SIM C)Turn off find my iPhone ??? How people out there actually steal an iPhone and continue to use it with the stolen SIM and personal data as if it were their own phone? 1 in a million, and that’s the story we’re reading about. Well, Had this enabled on iPad32-WiFi only that was ripped off… Problem is that I didn’t have auto-join to untrusted networks for various reasons (other safety issues) and without — it just doesn’t work. What we need is something that Apple can do to reg. a ser. number/uuid and track it should someone try and activate via iTunes. the presumption is that one who buys a used ipod (like me) and finds it MAY (or may not) be lost or stolen, and tried to find a way to locate the last (presumably legal) owner – there is almost NO information to help someone who is NOT a thief, and a ton of crap about how to find a stolen phone, even if it is NOT stolen, or if the person who has it is TRYING to return it (if it is indeed lost or stolen)…. thanks to our digitally insane culture, the presumption of innocence is apparently totally suspended when it comes to microdevices. Now I am reading warnings about MY liability for even having it in my possession, or erasing it. Believe me if it is stolen I would like the one that sold it to me to go to jail, you betcha! Can anyone help me find who this belongs to? apparently it is linked to a gmail address of someone, probably the legal owner, but there is no way to find them, unless of course the get all pissed and show up at MY house looking for ‘the theif’… Crap. I think I am turning this in to the sheriff tomorrow.